The most peaceful moment of my life, and I was riding a jet ski! Today I bring you a summer themed blog post. All of these items brought to mind the time in my life when I was still living with my parents and they just so happened to have a 30 foot boat and a jet ski. Needless to say, I spent A LOT of time at the lake. I don’t know if any of you have ever been to a lake, or even the ocean, but if you have…you may have had this experience i’m about to describe to you. It was one of the most juxtaposed experiences of my life and i’ll tell you why below. This lake my parents kept their toys at was not a large lake. It barely let their big 30 footer do much touring of the waters. It would take less than 15 mins to get from one end to the other if going at mid-speed (20-30 mph). It doesn’t get super crowded except on holiday weekends when everybody decides they want to be a boater and the closet fisherman dust off their rods and have a go. It was the perfect size for the jet ski though. I would very often take it out on my own and go full throttle chasing waves and boats or finding a secluded area and taking a dip. Now about this peaceful moment I mentioned earlier…contrary to what you probably are thinking, it was NOT when I was taking a dip in a secluded lagoon. Instead it was mid evening, around the time the sky turns that pretty purple, pink, orange color as the sun sets, and I was coasting my jet ski along at a breezing 40 mph. I remember it clearly, it was one of those moments that your mind goes into high gear and every minuscule detail is set in long-term memory. I remember the cool breeze with a touch of water spray, the tightness of my life jacket, and the brilliantly colorful sky. I remembering just looking up at it, taking a deep breathe of the admittedly not so sweet lake smell, and feeling a sense of peace descending on me. The world around me sped past, waves crashed into me, and it was getting a little difficult to see…but I was arguably the happiest i’ve ever felt. Now what does that have to do with this blog post? Well…if I could experience that every single day of my life I would have to live on a beach and this cozy setting is exactly how I would set it up. TATTOO: SwaggedOut – Drowning @ The Boys of Summer June 13th! 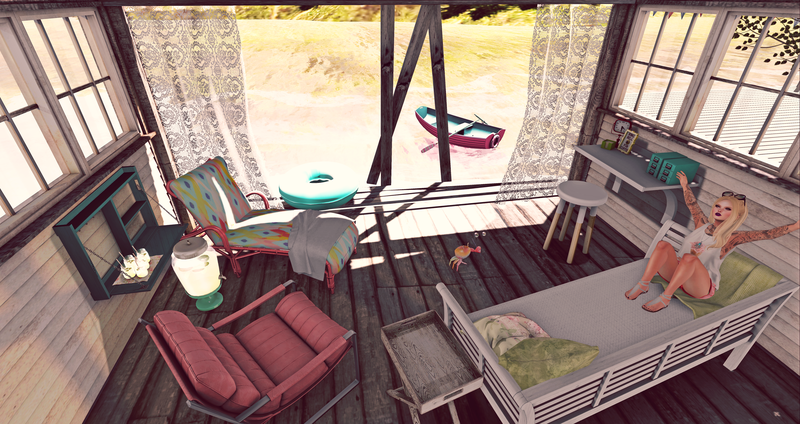 Scarlet Creative – Ete Cabin – 88L! < Previous What was your worst motel experience ever? I bet this fresh and cute set up beats it hands down! Next > Were we meant to be…another time…another life…?